Thirsty Pilgrim: Maybe We Should Just Call it Light Beer. Nice that the Wall Street Journal dedicated this piece--"The Connoisseur's Light Beer"--to session beer. Shame that all its picks are mainstream strength, from 5% to 5.4% abv. As I've argued before, the "session" mark has got to be set lower than that if it's going to mean much. Lew Bryson's 4.5% mark seems low enough to be meaningful but high enough to be reasonable. Our drinking culture is goal oriented: have a beer to accompany a meal or fill a short window of time after work and before a commute. Most drinkers don’t sit around and have a half-dozen beers before heading home and with craft beer prices in many markets approaching $7, 8 or even $10 a pour, regular ‘sessions’ would be bankrupting. Thoughtful stuff from Andy as usual, and he hits upon an important truth there. But it's not the whole truth. The reality of the U.S. beer drinking market is that people are drinking loads of 4.2% light lager. Considering the steady growth of craft beer, there would appear to be market opportunities for light beers of greater flavor. As far as fighting to "redefine American beer culture"... I'm no Lew Bryson, mounting an explicit awareness campaign, but I am a writer and drinker (is that redundant?) who often enjoys the lighter stuff in quantity. I can't speak for all sessionistas but I suspect most of them have motives as selfish as my own: to find more, better lower-alcohol options in our locals and shops. I dunno. I have to say the craft session and traditional American light lager divide is just not as entrenched for me. I happily buy Utica Club as well as your basic Miller and a few others that fill the session niche nicely on summer afternoons. They can actually co-exist with my gueuze or others in the stash without either spoiling. Like additives, however, too many adjectives like "Lite" or "Draft" or "Dry" and you are off in a wasteland of chemical effluent as far as I am concerned. Alan, I think we're making the same point in different ways. Session beer already has a massive following in North American if we're allowed to include light lagers. If not--for example, part of Lew's definition is "flavorful enough to be interesting"--then we are getting into tricky territory. Riffing on your point: My parents drink their share of craft beer, but when they want to drink in quantity they reach for Miller Lite. If there were a local microbrew available that hit the same sweet spot, in terms of low abv and drinkability, they would drink it. But the typical craft brewery still sees its "light beer" as a 5.5% hoppy pale ale or well-bodied blonde that shares only its golden color with the lagers that most people still prefer. I think we are close but not quite on the same page. There is an issue with craft-centric thinking that fails to notice that there are regional 4.5% traditional light lagers, etc, that are "flavorful enough to be interesting." I think it is a false distinction to say that one group of industrial manufacturers labeled craft make the good stuff while others labeled macro do not - especially in the session beer context. But that distinction is a premise on how the discussion of session occurs. There may be cultural and marketing tensions that explain this but from where I sit what is really being discussed is how craft beer gets itself into the huge market of session beers, not how to create mass interest in low alcohol beer. "that there are regional 4.5% traditional light lagers"
Actually, where I'm from, these don't exist anymore and haven't for many years. I can't think of very many elsewhere in the U.S. either. Yuengling, maybe. When they did exist, few got as low as 4.5%. However, the 4.2% Boulevard Wheat is probably the Midwest's most popular and successful craft beer. Few others have learned from that example. "I think it is a false distinction to say that one group of industrial manufacturers labeled craft make the good stuff while others labeled macro do not"
Which is not the same as saying that craft versus macro is a false distinction, even when the line is tricky to draw. In this case, the energy behind "session beer" is not coming from people who want more light lager. It's coming from more or less dedicated craft beer drinkers who want more options. What's interesting is that in the UK the opposite is true - we've got pubs lined only with beers under 4.5% and the ones over 5.5% struggle to sell. Like the opposite of the US drinking culture, the UK one is based on drinking all evening so low abv is important. Whenever I go to America to drink I so always crave something under 4.5% to keep me going a little longer. Plus there's more skill in brewing a great low abv beer so I'd love to see some of the breweries I enjoy the most producing some. Well, maybe I am lucky. Popping over the border to NNY, I can get Yuengling as well as Genny as well as Utica Club if I go south far enough. These are inexpensive yet tasty brews that are not over the top in strength, have some tradition and all sit on that balancing point between craft and crap. Heck, Utica Club is made by the same good folk who brewed most of the Brooklyn Beer you ever had, F.X. Matt. And Narragansett is now a stable mate of Genny Cream out of High Falls at Rochester. Give me their porter any day... though it's 7% so not all that sessionable. For me, these are all session brewers that make decently priced and modestly strong beers that most beer drinkers (aka the 94 to 96%) would be fine with. Makes for very tricky line drawing, too. I find this fascinating. In Ireland, mainstream beer is all about 4.3% alcohol (Bud is 4.3% here, for example). You have to look to imports or local craft beer to get above 4.5% or below 4.0% and most indigenous craft beer falls in the 4.3% - 5.0% range. 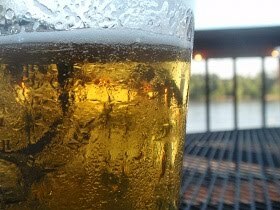 The average drinker would consider beer below 4% to be pointless, while any beer above 5% is considered dangerously intoxicating. Sure, none might be below 4.5%, but isn't that a rather arbitrary number? You would have to drink six pints of Sierra Pale for the total alcohol content to equal that of seven pints of Sam, and at that point surely we're picking nits, aren't we? I say this whole session thing is overwrought and that, with the exception of certain specialty beer bars where a quest for the newest and greatest thing results in 14 of 16 taps pouring beers of 6% or more, craft session beer in the United States is pretty damn easy to find. Even easier in Canada, I might add. From my Wisconsin (well, formerly) perspective, I used to very much enjoy Leinie's Red, 4.9%, and New Glarus pays the bills by selling Spotted Cow, at 4.8%.